They change homes often but they can always be found in one environment -- they're coral reef hermit crabs. Hermit crabs are defined by their need to wear other creatures' shells as protection, and they change shells throughout their lives. They're often peaceful creatures who are helpful to fellow reef dwellers. Reef hermits can be found in a wide range of colors and patterns -- they're often red, blue, striped or spotted. When outside of the shell, a reef hermit crab is a front-heavy creature indeed. The claws, legs and head look like most crustaceans, but the thorax is soft and curled to the crab's side. The first pair of legs is modified into chelipeds or pinching claws. Some reef hermits can reach lengths of 12 to 18 inches. Others are tiny, never growing larger than an inch long. Reef hermit crabs are primarily detritivores, meaning they eat bits of dead or decaying matter they find on the coral reef. Other species are algae eaters and are considered desirable in marine aquariums for this reason. If they're especially hungry, hermits may snack on living sessile organisms, like corals or clams. Hermits can be found in very shallow water reefs down to deep, cold waters. The red reef hermit (Pauristes cadenati) lives in reefs 25 to 100 feet below the surface. Hermit crabs have been found living at depths of up to 1,000 feet. Hermit crabs don't produce a hard, chitinous outer layer like most crustaceans; instead their bodies are specially adapted to wearing discarded gastropod shells. Hermits are actually attracted to the smell of a dying snail, which is how they find newly empty shells. A hermit's back pair of legs, called uropods, hold the shell onto the body. Hermit crabs' legs and uropods are also covered with scales, providing traction to help hold on their armor. This specially adapted gripping system makes it very difficult to remove hermit crabs from their shells. If shells are selected properly, hermits are able to withdraw their entire bodies inside. Sealing off the opening with a pincher is another line of defense used by some species. Reef hermits have come up with some creative ways of dealing with the shell acquisition quandary. They form what are called synchronous vacancy chains, which are long queues of crabs passing shells down the line, all looking for one with the perfect fit. Fighting over shells is typical among same-size crabs. Smaller crabs allow bigger crabs to evict them to avoid a potentially lethal fight. 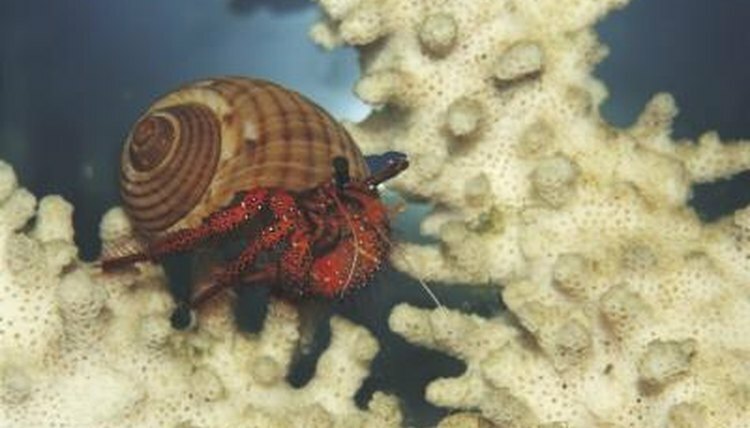 Shell availability greatly affects whether hermit crabs can grow and thrive, and they're limited to living where gastropods also make their home. Some hermit crabs take their defense system a step further and partner with an anemone. The jeweled anemone crab (Dardanus gemmatus) is one example, often found with anemones like Calliactis polypus atop its shell. Together the animals form a symbiotic relationship -- the crab gets extra protection from the stinging anemone and the anemone gains mobility plus a ready food supply from the crab's scraps. Anemone hermits may form bonds with other animals, including flatworms, barnacles or amphipods. The Conscientious Marine Aquarist: Fenner, Robert M.
Advanced Aquarist: Calling All Hermit Crab Exhibitionists: Hand-Blown Glass Shells!